Richard Maponya is best known as one of the successful pillars in the South African business sphere. To date, his biggest project is the joint venture with property group ZenPROP in the construction of the Maponya Mall, a mega shopping mall in Soweto. Born as Richard John Pelwana Maponya, the South African business powerhouse is a recipient of The Order of the Baobab (GCOB), a South African civilian national honour, awarded to those for service in business and the economy. At age 24, he worked for a clothes maker as a stocktaker. He got a promotion for himself and his manager who was white and as a show of appreciation, the manager sold him some second-hand clothing which he went and resold. This provided some capital which he used to open up his own cloth retailer but the government of South Africa at that time refused to give him a license. In the 1950s, Richard Maponya and his better half started the Dube Hygienic Dairy, a business that employed many young boys to deliver milk by use of bicycles to clients who had no electricity or means to refrigerate it. By 1970s, this venture had expanded and yielded a number of general stores. Around this time, he was an active member of the Urban Bantu Council but he later resigned in 1977. This happened after the youths that were linked to the African National Congress (ANC) asked him to resign. In the 1970s, the regulations were less strict and he managed to set up 2 grocery stores, a butchery and a food restaurant. These grew and further yielded bottle stores, supermarkets to mention but a few. His BMW franchise was frustrating since he was able to sell a huge number of cars in a week yet he got very few cars to sell. He formed the Kilimanjaro Holdings Limited together with a number of black businessmen and they managed to put up a bid for an East London bottling plant that became very successful. This happened after Coca-Cola stopped investing in South Africa. Richard Maponya was chosen to be the chairperson of the Kilimanjaro Holdings Limited. He is regarded as an Icon in the Soweto township and in South Africa as a whole. Read here, everything about the life and times of the business titan, including his family, biography, house, cars, his worth, and other interesting facts. Business mogul, Richard Maponya was born on December 24, 1926, in Thlabine, near Lenyenye in the Northern Transvaal (now Limpopo Province). He attended Kagiso Teacher Training College, where he was trained as a teacher. As a visionary businessman, Maponya needed a supportive partner who would help take his business to greater heights. He ended up marrying Marina Nompinti Maponya, a beautiful South African woman born on November 29, 1934, in Sophiatown. Marina, a cousin to late former president Nelson Mandela, was a social worker until the time she switched over in the late 1950s to join her husband. She attended Jan H. Hofmeyr School of Social Work, located at Eloff Street, Johannesburg. A recipient The Order of the Baobab in Gold (Posthumously bestowed on her in April 2016), she died on June 5, 1992, at 56. Prior to her death, she worked as the director of Barclays West Bank Limited, the director of Putco Transport Company and was also involved in social development. Her legacies in the country earned so many awards including the Golden Award for development of the positive image of South African Women and the Business Woman of the Year Award in 1982. Marina was instrumental in the acceleration of her husband’s business in the country. From his dairy business to his restaurant, butchery and later supermarkets, liquor stores, fuel retail and motor retail businesses, she played pivotal roles in her position as her husband’s business partner in shaping their commercial activities. Richard is blessed with 8 children and 18 grandchildren. Richard Maponya is among the wealthiest known business personalities in South Africa. Although he started small, today, the Maponya Group’s ventures (his company) include property development, horse racing and breeding, retail, automotive sales, filling stations and liquor stores. His company’s net worth is estimated to be over R400 million. As an elder statesman of black business in South Africa, Maponya lives large. He owns a majestic mansion in northern Johannesburg. Though there’s less information on the business mogul’s assets, we strongly believe he has luxurious properties that befit a successful man. Maponya’s mall is one of the biggest in South Africa. It was officially opened by Nelson Mandela in September 2007. The R650 million mall houses more than 200 stores and a cinema complex. The business tycoon secured the land on which the mall is situated in 1979, first on a 100-year lease. He would acquire it outright in 1994, after several attempts. He is the founder and pioneer president of the National Federated Chamber of Commerce (NAFCOC). 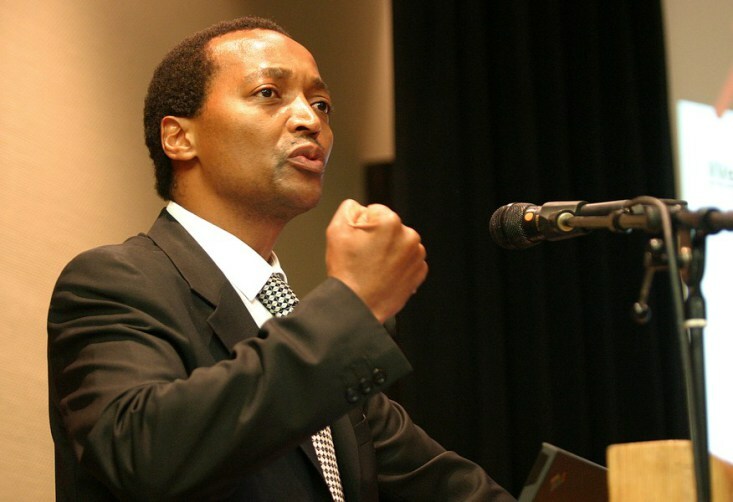 The business mogul is founder and trustee of the Nelson Mandela’s Children Fund. Maponya is also a trustee of the Urban Foundation and the SA Foundation. His Motor City on Klipspruit Valley Road in Orlando East was launched on March 29, 2012. It was the first such business in the south of Johannesburg. It includes a Toyota and Volkswagen dealership respectively. Richard Maponya chauffeured Mandela when he was released from jail and arranged for an envoy of 10 BMWs and chauffers. This was after Richard and his wife visited Mandela at the then Victor Verster Prison in Cape Town. His nephew, Micheal Maponya, was Mandela’s personal chauffeur up to his last day. The property developer made it possible. At the 2012 Africa Awards for entrepreneurship, he got the Lifetime Achievement Award. The emblem of the Maponya Africa Group is an elephant, which he said symbolises wisdom, fearlessness, and community. The respected property developer named his first horse “Another Colour” and was the first black South African man to choose horse racing colours for his horsemen. The colours were ANC’s black, gold and green. He owns a stud known as Black Charger.